What if we stopped making Valentine’s Day all about US? I’ve been reading a lot of blogs this past week about how much pressure we put on our husbands to perform on Valentine’s Day and how our expectations set them up for failure (see link below). So I want to share a different idea with you. This won’t work for every family but it might just work for yours. First of all, let me tell you that this Valentine’s Day idea is NOT something I came up with because I’m the best wife or mother ever. In fact, in between the start of this tradition and now, my marriage almost totally self-destructed because I wasn’t the best wife ever. And if it had destructed, that wouldn’t have helped my best-mother-ever status any either. This is something I wish I’d have come up with because I was already the best wife ever! Nope. The almost-self-destruction that I mentioned was for a million different reasons that aren’t part of this post. I just wanted to mention it because while I wish this was part of an original plan to give my husband tons of honor and show my ability to selflessly serve him on a consistent basis (like we should be doing), that’s NOT how this all got started. But I propose to you, in hindsight, and taking no credit, that this idea is brilliant for many different reasons! 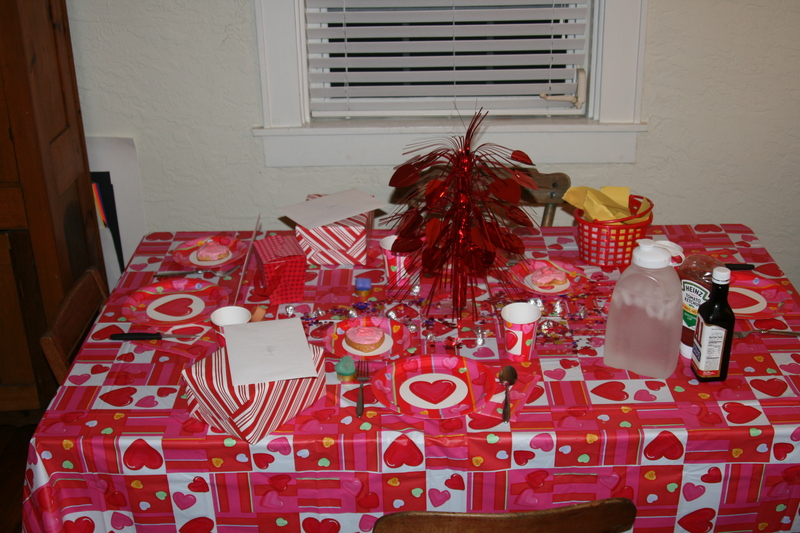 This Valentine idea to take this “chick holiday” and use it to serve our guys (instead of sitting around waiting for them to do what we do best!) got started by my daughter. 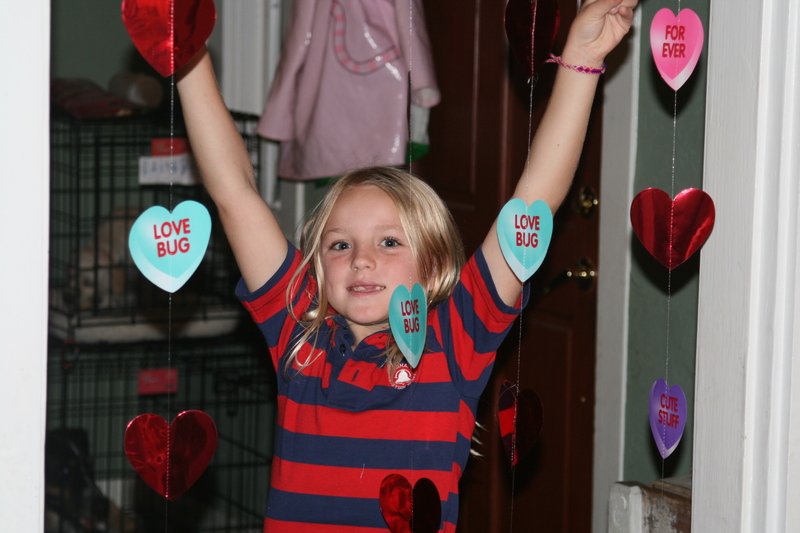 When she was about 7 years old, she was really in to all of the Valentine’s Day stuff (like any little or big girl would be!). She was just getting in to decorating and baking and whatnot. 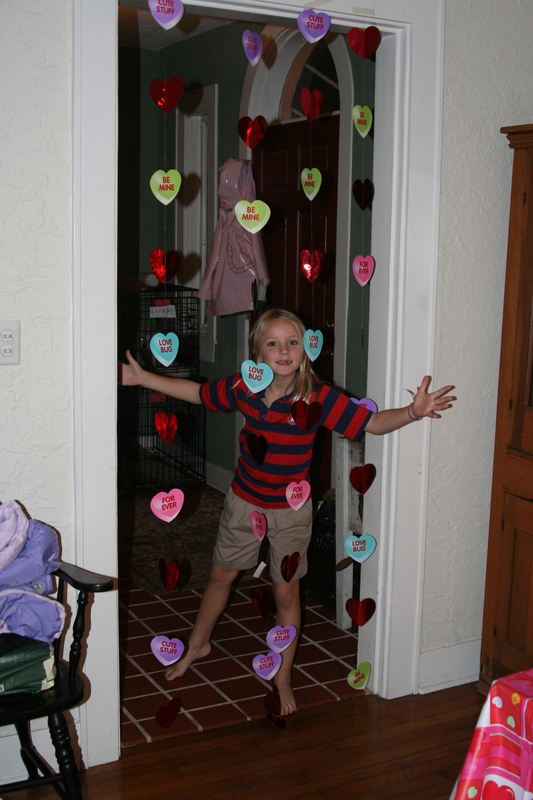 So she asked if we could decorate for Valentine’s day. 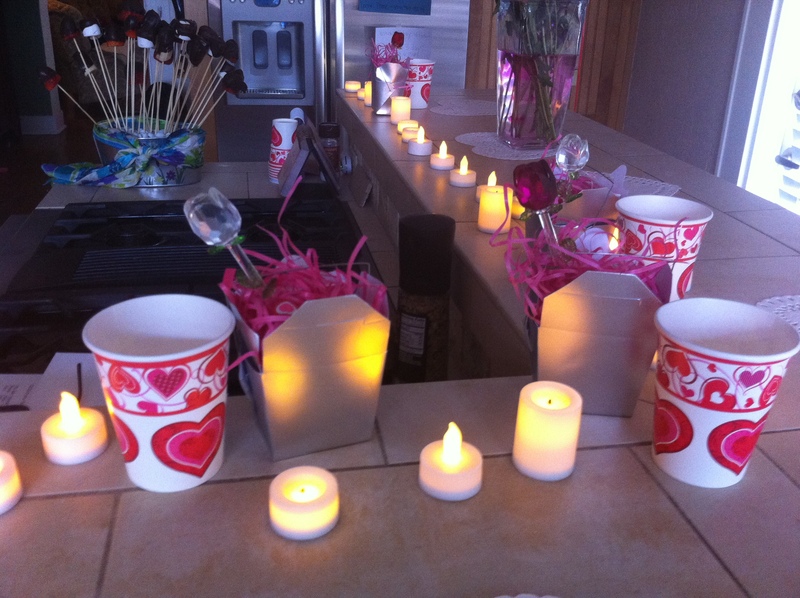 One thing led to another and we came up with this idea to decorate FOR the guys and serve THEM on this Holiday! 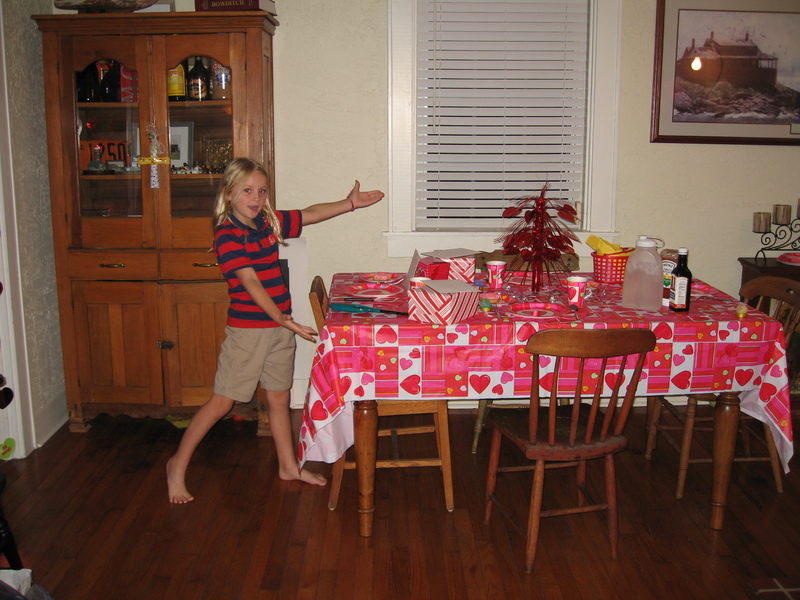 That first year (and every year since), we asked the guys to go out for a little while so Haley and I could prepare the dinner and the decorations. The first year it was a surprise but now they know the drill. While the girls are preparing, Dad takes Steven out to bond with him over last-minute-holiday shopping for the girls so that he’s getting some good training in there too! 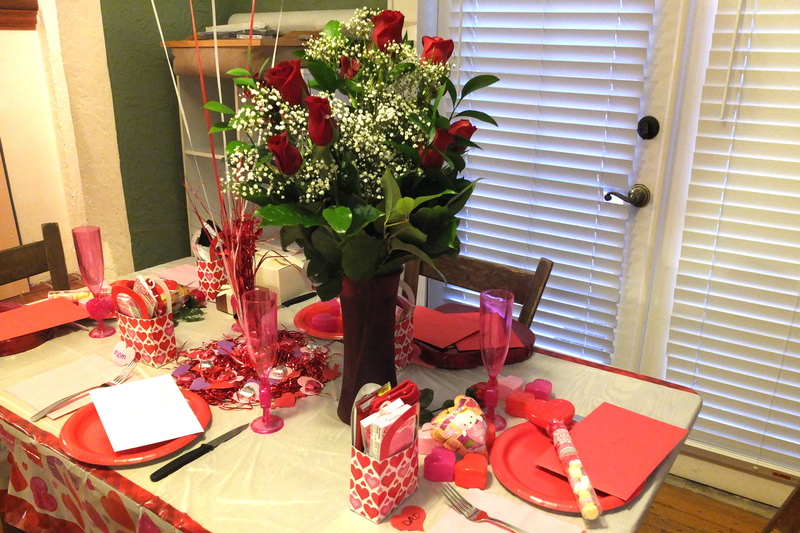 And we made a big deal of decorating the table with all kinds of little details. The Peaceful Wife blogged about how Valentine’s Day puts a LOT of pressure on guys (see The Peaceful Wife’s post here about that). This might be your husband’s love language (to shower you with homemade dinner, gifts and decorations) but I’m guessing it’s not! If it is, please don’t even think about taking this pleasure away from him! But if your husband is like most men, this idea of my daughter’s would take a TON of pressure off of him and also THRILL your sons or other children. 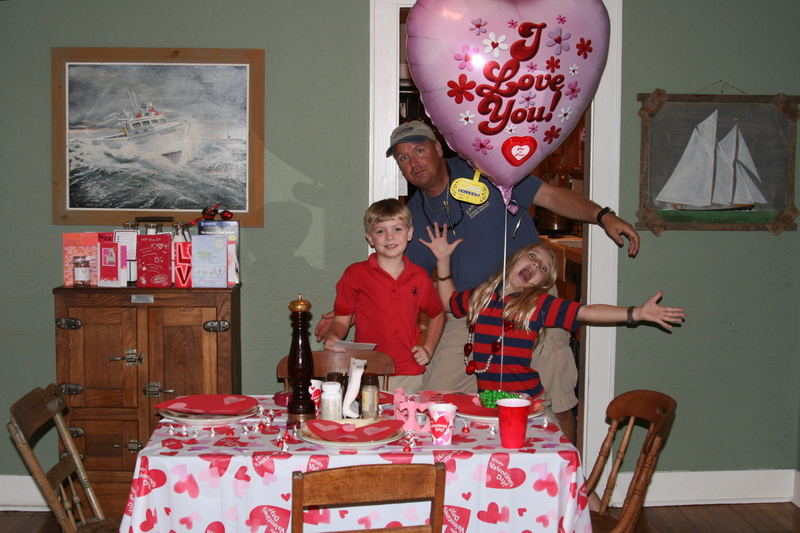 My son love, love, loves Valentine’s Day because of us! 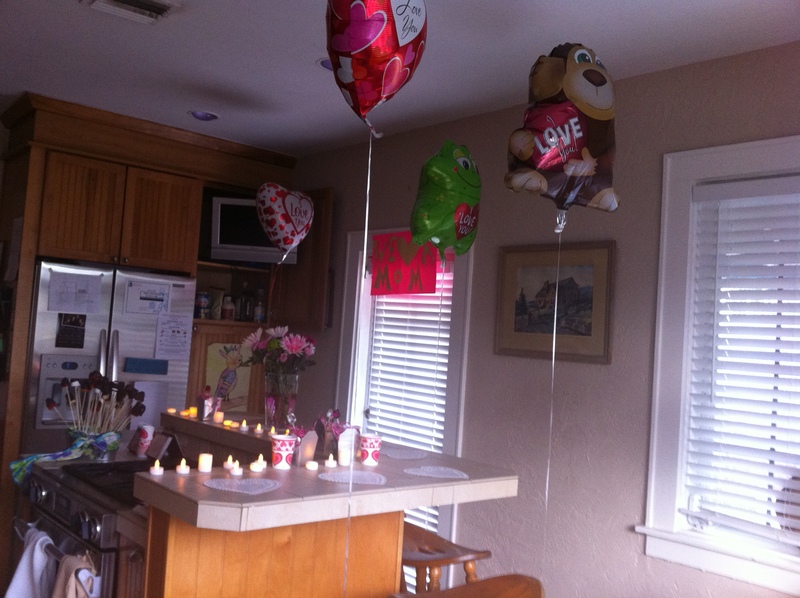 He squealed the first year he came home to this as a 6-year-old! His future girlfriends will probably hate us for it – I’m still trying to figure out how to deal with that one! And guess what? Serving takes your mind off of those pesky expectations you might have about what you’ll be RECEIVING. 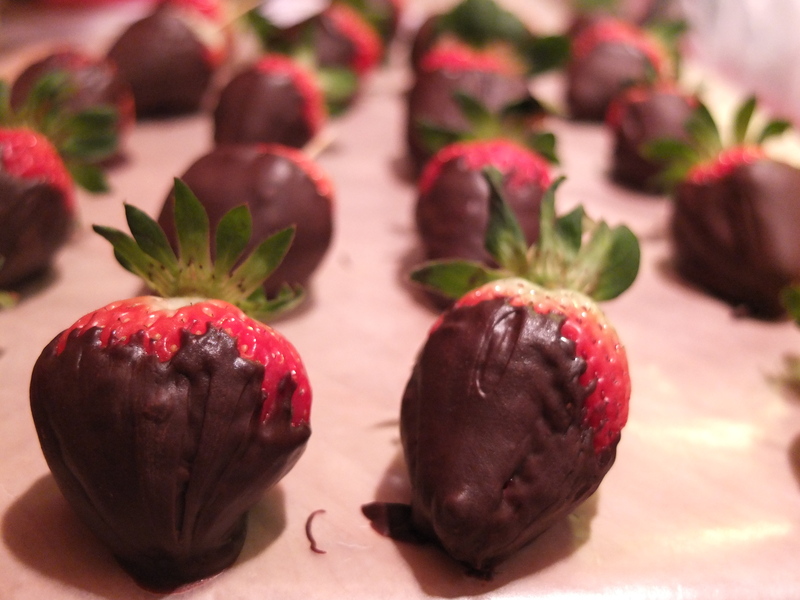 This year we even made our own edible fruit bouquet! 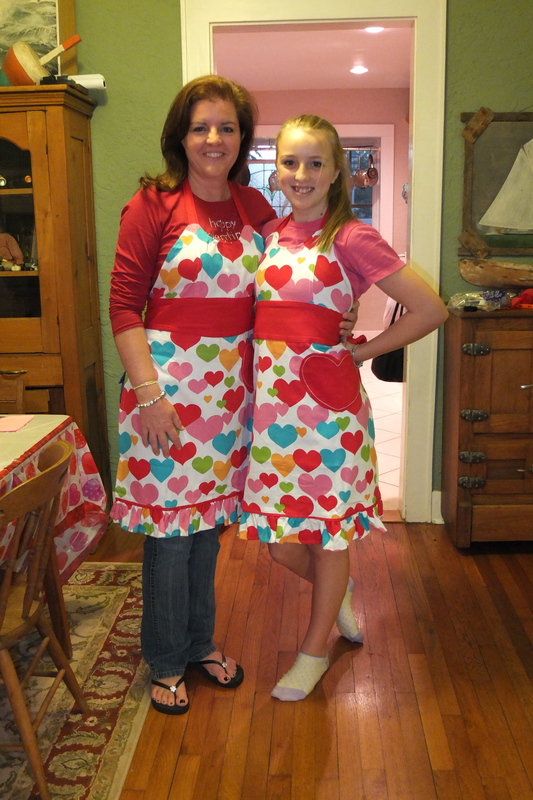 In 2012 we got matching aprons! My husband provided the roses! Each person gets a gift bag from the hosts (us girls). 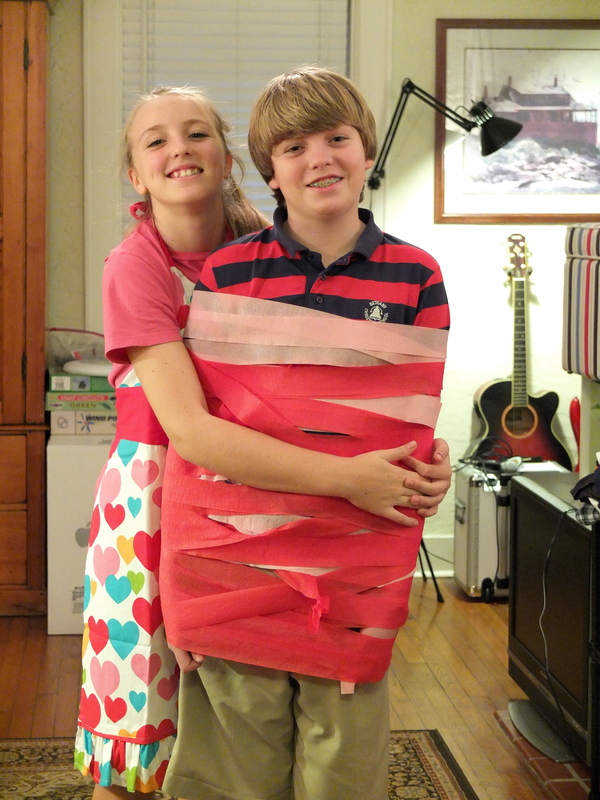 Haley even decorated Steven last year! So far, this year, we have purchased some heart-shaped cake pans and a LOVE cake pan from Target. We are going shopping for groceries and decorations on Monday. Your family make-up might be different. You might have all boys or a mixture or just one child – or none! But you can adapt this however you see fit. The key is to get in to service mode and not be sitting around waiting for your husband to do it the way you’ve envisioned in your head. A commenter on The Peaceful Wife blog said that “expectation is premeditated resentment”. So stop thinking about what your husband is going to do for you and start thinking about what you can do for him! Friday, February 1, at our monthly MOM’s meeting, Marcy Beaupied guest-spoke for Vickie in the Happy Heart segment. 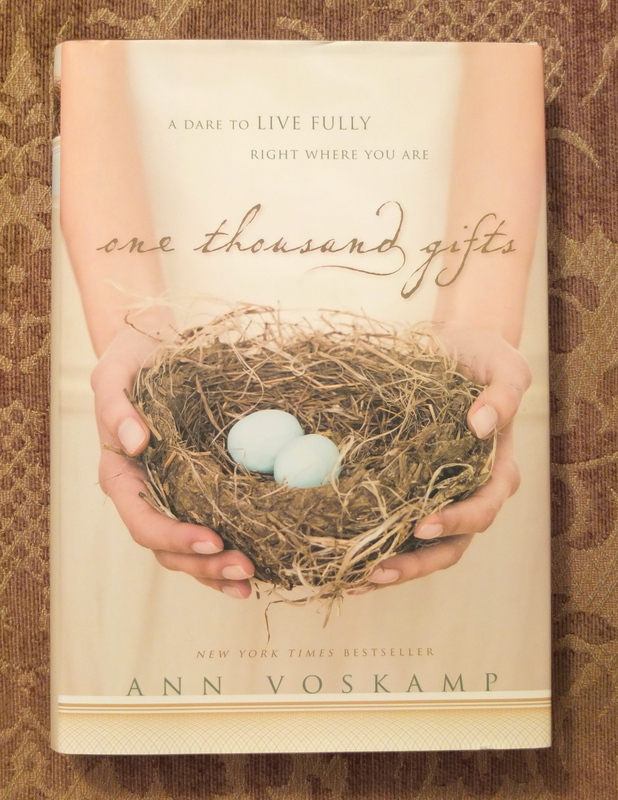 She mentioned the book “one thousand gifts” by Ann Voskamp. The book, which encourages you to focus on seeing the beauty/God in everything, encourages you to start keeping a gratitude journal (looking for one thousand “gifts” to be thankful for). At the meeting, Marcy took it one step further and suggested we start a gratitude journal with our kids. I loved this idea! Marcy had actually given me this book two Christmas’s ago as a thank you gift! I was immediately on fire to list 1,000 things I was thankful for! I found myself keeping my eyes so much wider open for all the little things we usually take for granted. Unfortunately, as I do with many things, I got started and then kind of lost my motivation. I even downloaded the app on my phone that encourages you to take pictures of things that you are thankful for. That was right up my alley. But the journal and the book, and even the app, kind of disappeared in to the bowels of my house. And so did my motivation. Well, guess what I ran across when I was getting my marriage books ready for MOMs last Friday? The gratitude journal that I had no idea Marcy was going to talk about!! 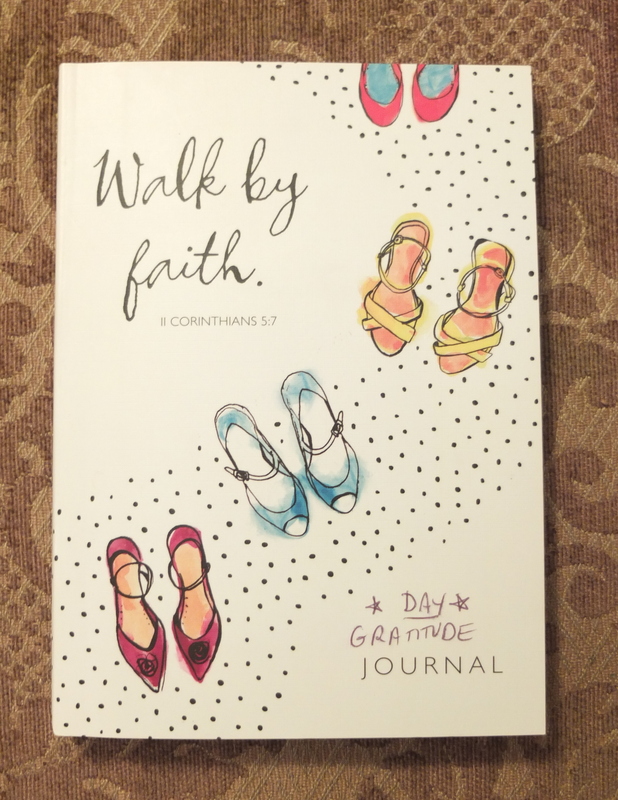 Guess how many “gifts” were listed in my 1,000 gifts journal? 15!!! How lame is that?? I was 985 short of my goal! I did, however, also find that deeper in the journal, I had listed my “Top 10 things of 2011” and my daughter had made a list too. It was fun to look back on those lists (consider adding that to your journal since 2012 is still pretty fresh in your mind!). I think that extra “top ten” list brings me short of my goal by only 975 :). Well, having rediscovered the journal, I decided that I had a second chance to get immersed in gratitude. So I immediately started adding to the list and quickly got it up to 20 (yeah, I’m a high achiever). After Marcy told us about getting the whole family involved, I was even more excited to get the whole thing going again with all of us. So I added a section for each family member. I got the opportunity to run it by the family the following Tuesday at dinner. That night, my son had piano lessons after school. My husband, Courtney, usually gets home around 5:30, give-or-take. He had gotten home while Steven was at his lesson. Well, as we came down our street from the lesson, Steven saw Courtney’s truck in the driveway and, as excitedly as a 5-year-old, said “Dad’s home”? He said it like he had just won the lottery! And he’s not 5. 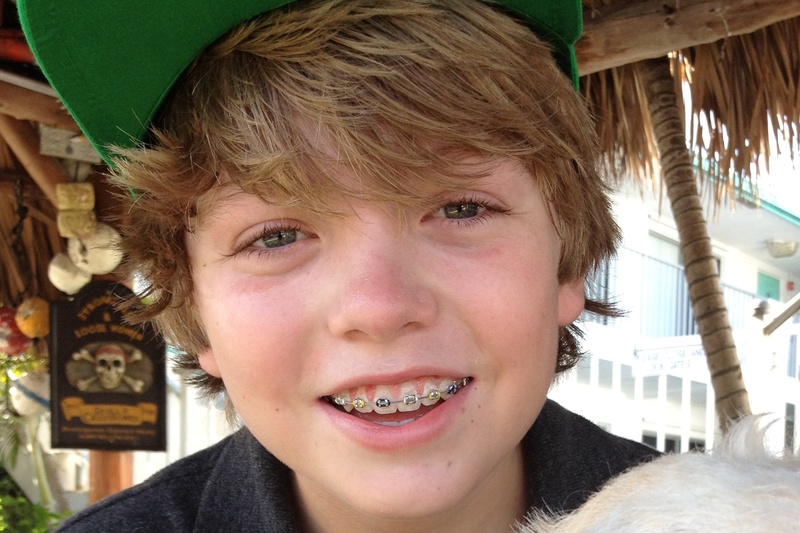 He’s a 5′ 6″, 12.5 year old man-child that looks like Justin Beiber :). I wondered if he and his Dad had some plans or something and he said no – he was just excited that Dad was home. He said, “Aren’t you?” (again, he said this like we should both be jumping up and down doing a happy dance). And I said, “YES”! (minus the happy dance because I reserve that for the specialest of occassions-like in the middle of the grocery store when I’m with my horrified, eye-rolling, teenage daughter). Well, we went in to the house and right to the dinner table. I pulled out the now-family gratitude journal because I was dying to share with all of them what had just happened in the car (my son’s excitement that Dad was home) and to tell them what I had written in the journal just days before. I saw it as a great opportunity to affirm my husband! So I shared my son’s excitement over his Dad being home and then I told them about the gratitude journal. And I read to them what I had written only days before. 16. When I get home and Courtney’s truck is in the driveway! Does this impact you the way it impacted me?! Steven put kid-like words and enthusiasm to what I feel in my heart when I see my husband’s truck in the driveway-a feeling I had just “documented” in my gratitude journal! And now we had an opportunity to let my husband know what he does to us inside!! Alhough my daughter is a bit more reserved, she also is a gigantic fan of Dad’s truck being in the driveway-but her happy dance happens on the inside! Well,the whole thing reminded me of a country song – and not just because my husband drives a pick up truck! Billy Currington sings a song called “Love Me Like My Dog. I don’t know where I heard this song but when I did, I was overwhelmed with a “that’s it!” feeling! I mean who doesn’t want to be loved like their dog loves them?? You can leave for 5 seconds to run and grab something out of your car and when you get back in the house, your dog acts like you just got back from a 2 year military deployment! He literally “smiles” with his tail and his tongue and his paws! He doesn’t know how he lived without you for the past 5 seconds!!! And let’s be honest, when your dog treats you like that, you can’t help but pick him up and pet him and rub his belly and let him lick your whole face (which is really gross if you pay attention to what he does with that tongue on other occassions-but that’s beside the point). My son and I realized this week that seeing my husband’s truck in the driveway makes our tails wag! And we told him so! We should be loving our husbands like “his dog” does. Or like his son does. Or like his daughter does. Or how about this – like Christ does. 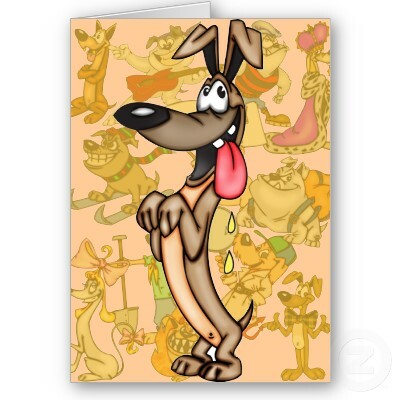 If your tail isn’t connected to your heart right now, just start wagging anyway and keep praying. Eventually God will connect your heart to your tail! I’m so thankful that God put that excitement in my heart for my husband (I had to fight to get it back a few years ago with God’s help!)! I pray that He will do the same for you. I think I’ll make that #21 in my our family gratitude journal…. 21. For putting a new heart in me so that I can love my husband like his dog does. In May, 2007, Dave Mulder, Bethany Christian School’s headmaster, was diagnosed with cancer. After a courageous battle, he went to be with the Lord on May 19, 2008, at only 53 years of age. He was survived by his parents, 3 siblings, his wife of 34 years, Mara Mulder Bonsanti (Bethany’s current music teacher! ), 6 children (1 who predeceased him) and 7 grandchildren (with one on the way at the time). Dave and Mara were blessed with 5 girls and 1 boy. 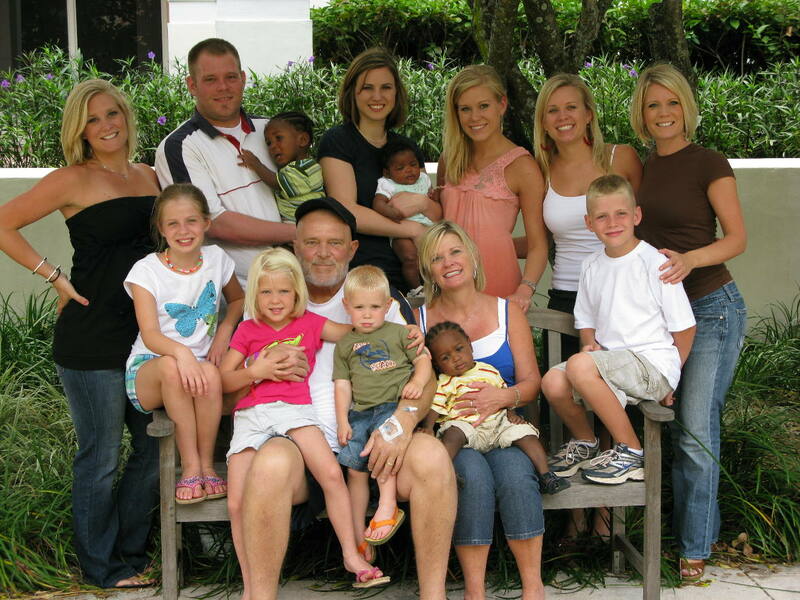 Their son, Jeremy, and his wife Christi (back row, 2nd and 3rd from the left), a pastor and social worker, realized after many years of marriage that the chances of having their own biological children were slim. Right before Dave received his diagnosis, Jeremy and Christi decided that they would open up their hearts to adoption. After several foster care placements, they started caring for a set of twin boys who were born prematurely and were placed in foster care because of the biological parents’ ongoing struggle with addiction. Jeremy and Christi became foster parents to the 3 lb. boys with the intention of adopting them. Less than a year later, while still fostering the twins and working through the adoption process, the mother of the boys called Jeremy and Christi to say that she was expecting another child and she wanted Jeremy and Christi to take the new baby too! On the day of her delivery, Jeremy and Christi brought Michael and Anthony’s sister Jada home with them. Three months later, Jeremy’s father Dave went to be with the Lord. At Dave’s funeral, the Bethany PTF put out orchids on each of the tables in the fellowship hall. 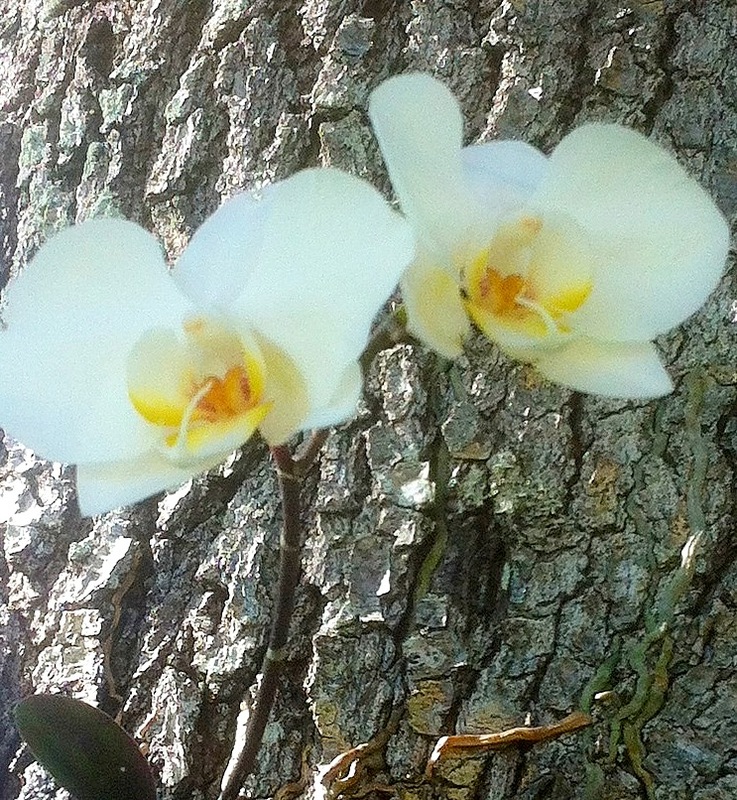 Dave’s wife, Mara, took one of the orchids home and mounted it on a tree in their yard in Miami. South Florida is blessed with a subtropical climate which lends itself to the cultivation of tropical plants. It usually takes about a year for orchids to bond with the trunk of a tree. But years later, Mara’s orchid, now shriveled and lifeless, had never bonded! In the summer of 2011, after more than 10 years of inability to conceive, a series of God-incidences led to news that the family had thought “impossible” – Jeremy and Christi were expecting! 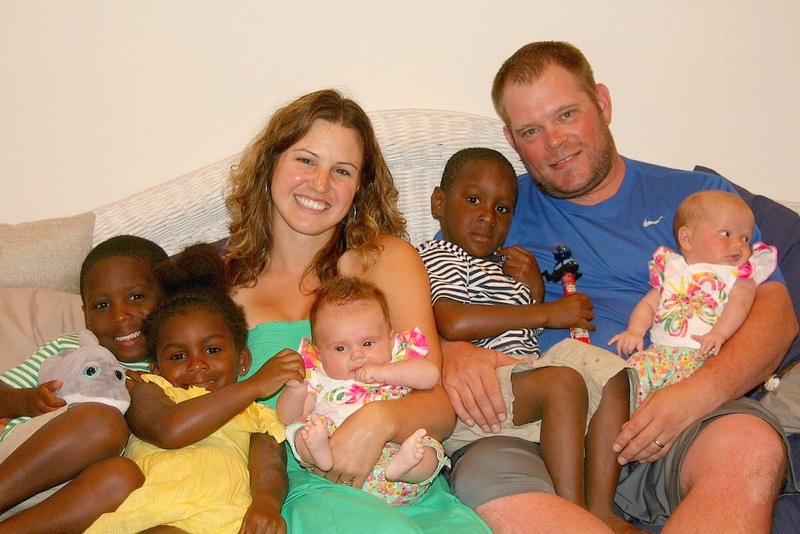 As the adoption of Michael, Anthony and Jada was being finalized in the Fall of 2011, they learned something more – Jeremy and Christi were expecting another set of twins! This time, twin girls! 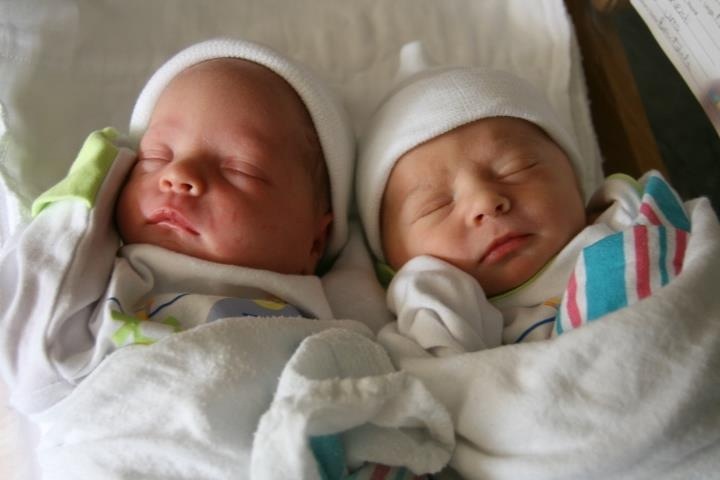 Avery Grace and Nora Abigail Mulder were born on April 20, 2012. Mara was able to fly up to New Jersey to join Jeremy, Christi, Michael, Anthony and Jada as they welcomed their miracle babies! Mara said that with every new grandbaby, there is always a sadness that Pop Pop (Dave) can’t be there. She says that she always wonders if he knows. If maybe he can see? Or if maybe Dave somehow feels the grandbaby’s arrivals up in Heaven. Well, remember the orchids that Mara planted on the tree from Dave’s funeral? The orchids never bloomed in the almost 4 years since Dave had passed away. In fact, a few weeks earlier, Mara and her husband had discussed removing the dead vines and wire from the tree because it was clear that there was no life there – not unlike what Jeremy and Christi had experienced in their journey to concieve. But Mara couldn’t bring herself to remove the dead vines because, to her, they were a part of Dave. This is a picture of Pop Pop Dave’s orchid on the day the twins were born. Four years later, after absolutely no sign of life, God sent this undeniable sign to them that nothing is impossible with Him! And that He cares about every little detail of your life! Are you struggling with something “impossible”? A “dead” marriage, “dead” finances, a “dead” relationship, a “dead-end” quest to be parents? Feel like there’s no hope? Then you haven’t given your situation to the Mulder’s God! Merrie Beth Day is a marriage speaker in Fort Lauderdale, Florida. She learned, first hand, about the powerful influence women have to build up or tear down their homes. She went from being a foolish woman who tore down her home with her own hands to a wise woman who built it back up with God's help! The Wise Woman Builds! She and her husband Courtney have been married for over 20 years and have a teenage daughter and son. You have to have the Good News before you get the bad news! A sad state of affairs (or even the reason for some?)! Who’s The Leader In Your Home?